12¾ (14½, 16, 17½, 19¼)" circumference. Bonnet shown measures 16". Designed to be worn with about 2" of negative ease. At the age of ten, Northanger Abbey’s Catherine Morland might have chafed at the necessity of wearing a bonnet, and she might have lost it rolling down the hill behind the house. 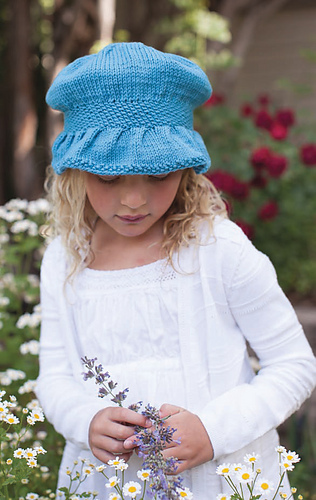 This sweet hat will protect the delicate skin of your favorite young lady. First, the ruffle is worked back and forth using short-rows. Then, after the pleats have been completed, the rest is worked in the round with swirl-shaped crown decreases. 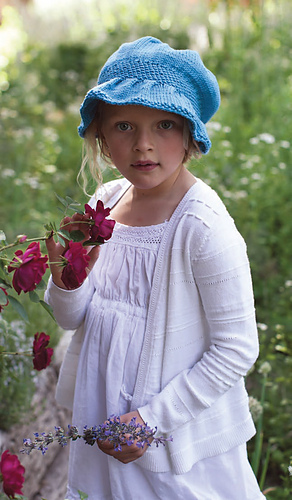 • This bonnet is knitted from the visor to the crown. The pleated visor is worked back and forth in rows using short-rows for shaping. 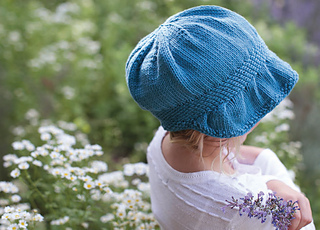 After the pleats have been completed, the hat is joined to work a seed-stitch brim in the round and a stockinette stitch crown. • Use a short circular needle for visor and for brim of larger sizes. Change to double-pointed needles when required. Row 1 (RS) K1, p1; rep from to end. Row 2 (WS) P1, k1; rep from to end.